Hanoi (VNA) – The Foreign Ministry is working intensively with China and countries along the Mekong River on together using the river’s water resource in a sustainable manner for harmonious interests of both the countries and their people living along the river. The Foreign Ministry’s Spokesperson Le Hai Binh made the statement when asked about Vietnam’s viewpoint regarding China’s announcement of releasing water from its Jinghong Hydropower Station on the Mekong River to the lower reaches during a regular press conference in Hanoi on March 17. Binh said Vietnam has asked China to increase the water volume discharged from the Jinghong hydropower reservoir to help it partly address droughts and saline intrusion that are hitting a number of its Mekong delta localities. According to the Vietnamese Embassy in China, a representative from the Chinese Irrigation Ministry met the Embassy’s representative on March 14 and informed that China will raise its water discharge from the Jinghong hydropower reservoir from 1,100 cu.m/second to 2,190 cu.m/second from March 15 to April 10, the level that doubles the average years ago. 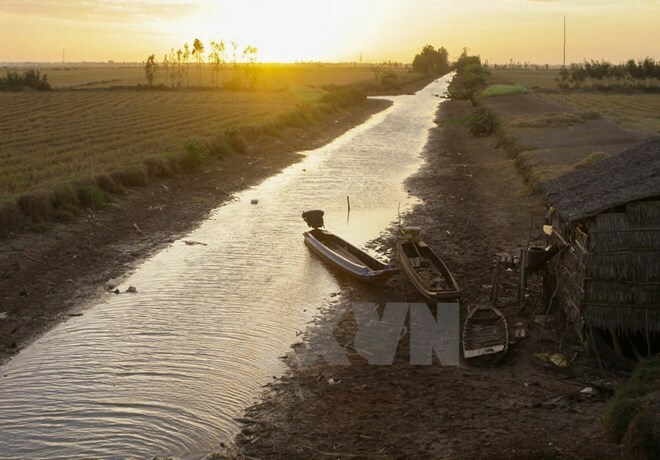 He noted that before sending the request to China, Vietnam’s relevant agencies had worked to outline specific plans to tackle drought and saltwater encroachment for the Mekong delta region and will make detail assessment on China’s water release. Asked about Singapore’s media reporting on Thailand’s plan to store water from the Mekong River for agriculture, the diplomat reiterated the country’s viewpoint that all countries sharing the Mekong River need to take responsibility for coordinating closely in using the river’s water resource sustainably. They must ensure hydropower facilities built on the river’s mainstream do not leave any impacts on the environment of the countries lying along the river, especially those at the lower reaches, in line with the Mekong River Commission (MRC)’s international norms and with respect for harmonious benefits of the river-shared countries and people living in the region.